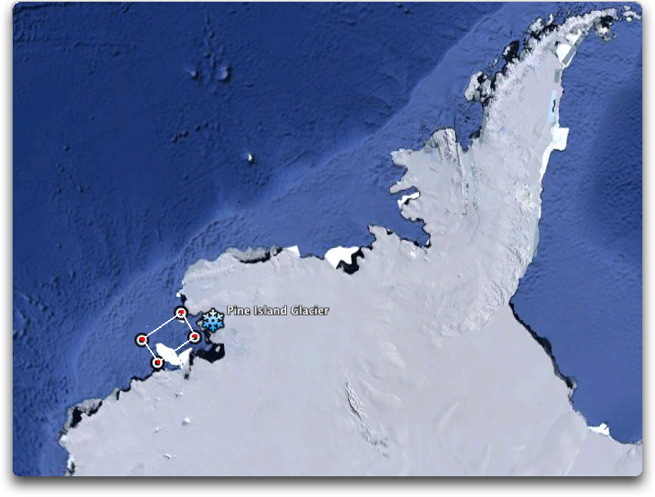 New research sheds light on Antarctica's melting Pine Island Glacier | Watts Up With That? New results from an investigation into Antarctica’s potential contribution to sea level rise are reported this week (Sunday 20 June) by scientists from the British Antarctic Survey (BAS), Lamont-Doherty Earth Observatory (LDEO) and the National Oceanography Centre in the journal Nature Geoscience. Thinning ice in West Antarctica is currently contributing nearly 10 per cent of global sea level rise and scientists have identified Pine Island Glacier (PIG) as a major source. As part of a series of investigations to better understand the impact of melting ice on sea level an exciting new discovery has been made. Using Autosub (an autonomous underwater vehicle) to dive deep and travel far beneath the pine Island Glacier’s floating ice shelf, scientists captured ocean and sea-floor measurements, which revealed a 300m high ridge (mountain) on the sea floor. Pine Island Glacier was once grounded on (sitting on top of) this underwater ridge, which slowed its flow into the sea. However, in recent decades it has thinned and disconnected from the ridge, allowing the glacier to move ice more rapidly from the land into the sea. This also permitted deep warm ocean water to flow over the ridge and into a widening cavity that now extends to an area of 1000 km2 under the ice shelf. The warm water, trapped under the ice, is causing the bottom of the ice shelf to melt, resulting in continuous thinning and acceleration of the glacier. Lead author Dr Adrian Jenkins of British Antarctic Survey said, “The discovery of the ridge has raised new questions about whether the current loss of ice from Pine Island Glacier is caused by recent climate change or is a continuation of a longer-term process that began when the glacier disconnected from the ridge. Steven Mosher has graciously allowed me to add my two cents worth here. As you know, I love data, it beats theories every time. Figure W1. Pine Island Glacier, Antarctica. The West Antarctic Peninsula is at the top right. Pine Island Glacier is shown by the snowflake. The white box outlines the area for which I show sea surface temperature (SST) below. Figure W2. 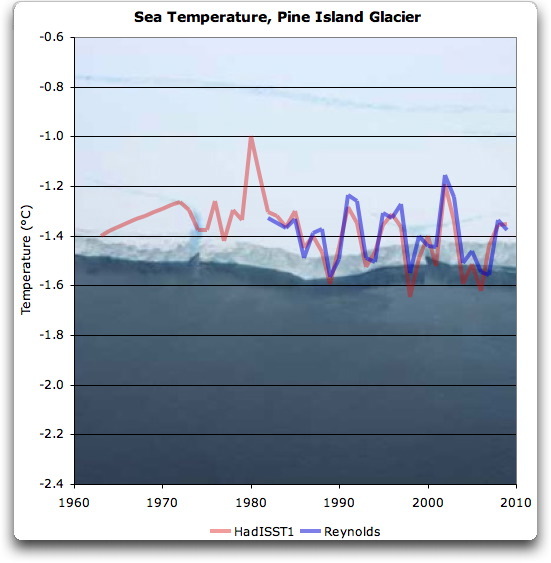 Change in sea surface temperature (SST) in the ocean off of Pine Island Glacier. June 21, 2010 in Antarctic, Climate_change, Glaciers, Uncategorized. the statistic is about 7 years old. But, we are still talking millimeters here. Silly millimeters per year. Benson & Hedges. That should give pause for an extra moment at best. It’ s not the sea-level rise that is of concern here, it’s the ice & cold from Antarctica escaping and lowering sea temps. Not to mention icebergs. Sorry….but I thought there was recently a volcano discovered in that neighborhood, just west of the Pine Island glacier??? …or was it a cold volcano and doesn’t count?? June 21st. Happy Winter to the Southern Hemisphere. I look forward to an epic winter and all the good ice building it brings to Antarctica, not to mention the beneficial effects it has on humans down there. 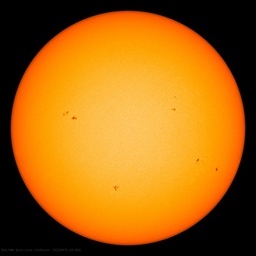 I also look forward to the solar minimum cooling lag time thread. are to certain extent impeded by the strong magnetic field in the area, the impediment being more effective to the warm saline currents (higher electric conductivity). Since the magnetic pole has been continuously growing weaker, and at the same time moving in the eastwards direction, the area of western peninsula is exposed to an unprecedented drop in the strength of magnetic field. As a result of these the warm saline currents velocity would be raising and hence bringing more and more warm waters. BP– “what, me worry?” Haven’t we been so forthcoming all along? Trust us…. I think our friends on the Gulf coast may wish as calmly as possible to monitor this situation closely. Best wishes and hoping this goes out with a whimper…. If 100% of the ice shelves on earth were to melt today, what would be the net rise in sea level? I’ve never seen an answer. Maybe they should be trying to pull the strands together on this one . . . and also working out what the consequences of increased freshwater melt means for ocean temperatures downstream and the implications of that etc for the” whole general mish mash”. “Highly sensitive temperature probes moving continuously across the bottom of the volcano revealed signs of geothermal heating of seawater. The heating was noticed especially near the edges of the feature where the freshest rock was observed. These observations, along with historical reports from mariners of discolored water in the vicinity of the submerged peak, indicate that the volcano has been active recently. -I wish more scientists would be honest and use those words more often. – So it looks like started before the recent ‘alarming’ warming, in fact during the cold swing. if warming were causing the glacier to melt, it would retreat. it would eventualy fail to reach the ocean at all. i don’t see how you can even talk about a ‘glacier’ once it enters the sea. utter nonsense. if the glacier continues to reach the sea, it is obviously gaining mass in the accretion zone. every real scientific article i have read by people who actually went to antarctica and measure real things has said antarctica is a net moisture sink. you think that would be obvious, too. but you can turn anything on it’s head with enough satellites and computer models. sigh, next up in the hit parade. @ peterhodges: A glacier is a “river” of ice – it flows (in this case into the ocean). So the “event”- whatever it was started before the period which the IPCC attribute to AGW. It’s worse than we thought- AGW has been going on since before 1970! These guys are just amateurs. A REAL scientist would have done more exploration into the method by which human activity caused this to begin. They should have consulted the hockey team. And no matter what the actual result is, they failed to emphasize that unless we pass Cap and Trade immediately, all of the islands in the Antarctic will melt, causing sea level to rise at about a meter per month… later followed by the obligatory “it’s worse than we thought”. There are also magnetic field changes in the Arctic too. As a result of these the warm saline current of the Greenland’s branch of the North Atlantic current’s velocity is raising and hence bringing more warm waters to Greenland and a temperature rise. In contrast the warm current’s velocity along the North Siberian coast is falling, as consequence the temperature is falling too. melting ice shelves do not rise sea level because the ice was already floating (there might be a non significant increase in sea level because a given mass of liquid water has more volume than the same mass in a frozen state). Their only potential for sea level rise is that their disappearance (or faster flow into the sea) might accelerate the gravitational advance of land ice into the sea. Some observations by Steig and Vaugham in different arts of Antarctica suggest that land ice slides more easily towards the sea when adjoining ice shelves are thinner or disappear. The net balance, however, requires computing annual ice accretion (mainly in the Antarctic hinterland) and ice melting. Global warming is predicted (by the IPCC) to increase precipitation over Antarctica, and that precipitation would turn into ice since summer temperatures are deep below zero everywhere (except in some summers at the tip of the Antarctic peninsula extending towards South America). Average annual temperature over Antarctica as a whole is -57°C. thanks alan. that was kind of my point, once a glacier reaches the ocean you expect things like calving. it is a completely different dynamic unrelated to how they are formed and move on land. If glaciers are melting – what can ice cores say about the history of the melt since the most important information is gone – melted away. a floating glacier is still floating ice. It has already displaced the water that it would if it was all melted. There won’t be any increase in ocean levels when those floating glaciers detach and melt away. The melting concerned in this thread is in the floating ice shelves along the coast. And they have not melted away: there is only some regular flow towards the sea and the occasional calving of some chunks. Ice cores are extracted inland, in deep ice that has not melted for many millennia. Can someone please explain where “deep warm water” came from? Antarctica is earth’s ice cube making machine. Period. How I wish I could post some photos of the frozen sea around Cape Town taken on 19/06/2010. People could walk out on frozen sea water over 100 meters. The barriers on the promenade are veiled in frozen seawater. Warm in relative terms, i.e. warmer than ice, and perhaps warmer than other deep water. But freezing cold anyway. There is besides some suspicion that the circumpolar current may have brought some warm water to Antarctica (hypothesis floated by Steig in 2009) but as Steig recognizes there is no evidence so far. Very nicely presented. Now, what makes the Hudson Bay Field fall and the Siberian Field rise? I dont understand this. The ice in question is floating in water? Right? So it follows Archinedes law. Right? So sealevel will neither rise nor decrease when it melts. Right? Only difference is salinity. Tiiiiiiiiny difference. Let’s see now, should I believe the Huffington Post or BP? That’s not even a coin toss! The Huffington Post agenda is clear for all to see. They aren’t risking their lives and their wealth. They don’t even have any credibility left to risk. I find it more than a little frustrating that, with claims that ‘the science is settled’, that these ‘scientists’ are forever making new discoveries of Nature’s effects on the world. Given that the effect on the ice of the 300m ridge was not factored into previous models, estimates, predictions, analyses, et al, will they now retract all of their previous descriptions and/or admit that they were wrong/ill-informed/guessing/etc? I am just curious but if the ice extended to the floor of the ocean to beyond the ridge mentioned and then melted from the bottom up as the article seems to indicate. Would not the volume of the liquid water be less than the volume of the ice before it melted? If this is true there at least initially should have been a net fall of sea level. Now the question is about the rate of condensation above Antarctica in relation to the rate of evaporation from the sea. I am truly wondering where the problem lies. I seem to remember that at one time sea level was much higher than it is now and for the foreseeable future. Also that it has been some what lower than it is now and for the foreseeable future. Might not this all be with in the bounds of historic levels. A given mass of liquid water has less volume (higher density,) else ice (frozen state) would not float. I think you meant the other way round? Only the ice on land can add to the ocean level due to the Archemdes law as pointed out above, so how much of the ice is on land/glacial flowing into the ocean? Percent? what effect would this have if any? Have we seen any effect from the ice which was “grounded” on the ridge and is now floating? Any cities gone? Am I missing something here. The article seems to indicate that the glacier is floating. How can floating glacier cause sea level rise? I wonder whether volcanoes might be having some kind of impact. The first evidence of a volcanic eruption from beneath Antarctica’s most rapidly changing ice sheet has been reported. The volcano on the West Antarctic Ice Sheet erupted 2000 years ago (325BC) and remains active. The subglacial volcano has a ‘volcanic explosion index’ of around 3-4. Heat from the volcano creates melt-water that lubricates the base of the ice sheet and increases the flow towards the sea. Pine Island Glacier on the West Antarctic Ice Sheet is showing rapid change and BAS scientists are part of an international research effort to understand this change. *The paper ‘A recent volcanic eruption beneath the West Antarctic ice sheet’ by Hugh F Corr and David G Vaughan is published in the February edition of Nature Geosciences (online). Thank you Hector M. I was getting the impression tha they wanted to take ice cores from the melting glaciers on Pine Island. “Deep Warm Water”-Maybe something to do with the Thermohaline circulation upwell circum-Antarctica (just a guess)? This tends to be out-of phase with N. Hemisphere. However, it cannot explain the more widespread thinning of West Antarctic glaciers that together are contributing nearly 0.2mm per year to sea-level rise. Ouch. 0.2 mm. That’s enough to cover a sheet of newspaper. Better get the Bounty towels out. Today’s climate scientists strike me as modern-day Neptunists, grasping at straws to hold onto a view of the earth and its climate as never changing entities — and the changes we see now are solely the result of mankind’s activities. And the skeptics are modern-day Plutonists. Sure hope this analogy holds, as the Plutonist school of thought ultimately helped form geology as we know it today (with a few hiccups along the way). Here’s a thought to ponder — in the history of geology in which the struggle between Neptunists and Plutonists took place, the matter took a couple centuries to resolve. Oh that’s just great! Does that mean we’ll have to contend with Al Gore and his acolytes for another century?!! The solution is quite simple, really. Just whitewash the snow, as is proposed for the Andean glaciers. I can look out my window and see plutons rising to 8,000 feet. Nice snow still on them. Keeeeer…..ching! or to put it another way…..Please send more grant money! Then shouldn’t you be able to demonstrate the effect of magnetic fields on such vortices on a laboratory scale? “The warm water, trapped under the ice, is causing the bottom of the ice shelf to melt, resulting in continuous thinning and acceleration of the glacier”.Would the ice be also cool down the warm water too as it melts?. I’ve added an update to the head post for those interested in the sea surface temperatures in the area. A few posters are confusing the effects of sea-ice melting & glacier/ice sheet melts. Sea ice is formed by the freezing of sea water when its temperature falls below -3C. Thus the melting of sea ice just returns the water it took from the sea only a matter of a few years previously. So no net rise in sea level. Glaciers & Ice sheets (essentially the same beast, just scale differences) are formed from compressed snow, thus when they melt, they return to the sea, water that may have been evaporated millenia ago. Thus a rise in sea level. That’s why there are mammoth bones dredged up from the bottom of the North Sea, which was dry land until the melt that followed the end of the last ice age and sea levels rising a few hundred feet. Really, are they seriously trying to scare us with 10% of 3.2 mm/year (last count I’ve seen with it having slowed in the last few years)? 2) less percipitation and the glaciers are still melting at the same rate as ever, just the mass is growing less. No need to, Michael Faraday did it some 200 years ago by his Waterloo bridge (Thames, London) experiment. The river tidal flow contained electric current induced by the GMF, river was an electric current generator! Around 1650 (Maunder Min) the Earth’s and the sun’s magnetic systems suffered a nasty jolt. Jolt could not have come from the sun and unlikely from the outside of the heliosphere. Awesome!….you’ll be considered by the Holy Inquisition because of your blasphemous assertions. Okay, the scientists say the major contributor to expected sea-level rise is this ice shelf. The ice shelf comes from ice sliding out to the sea from a clacier…. Other scientists have discovered a vulcano underneath. So, one natural event; A glacier sliding into the sea, and another natural event, a vulcano, is melting the ice faster than sea-water normally would. I cant help it, but my conclusion is then that when Al Gore and Stoere was standing there in Copenhagen and warned us about sea level rising…… the reason is …..a vulcano????? When is it the next jolt expected? According to my ‘astrology tables’ previous one was 1115-1173, and next one 2186-2232, which was of the opposite sign to the last, so is the next one. So, it means start of another warming period at 2232; does that mean 220 years of cooling? I sincerely hope my ‘astrology’ is wrong. Fortunately the firewood was rotten, couldn’t catch fire. “The discovery of the ridge has raised new questions about whether the current loss of ice from Pine Island Glacier is caused by recent climate change or is a continuation of a longer-term process that began when the glacier disconnected from the ridge,” says Dr Adrian Jenkins of the British Antarctic Survey. Once the grounding line began its downslope migration from the ridge crest prior to the 1970’s, a period of rapid change was inevitable, and since that time oceanic variability may have had relatively little influence on the rate of retreat. Or in other words the glacier would have shown the same acceleration and thinning it has shown since the 1990s with or without climate change, perhaps accounting for its very rapid melting and the local contrast with the general picture of increased Antarctic sea ice. Gosh, I just bought a huge bundle of cheap paper towels from Sam’s. Darn, I guess I’ll run back and get some Bounties if I’m not too late!